The 1917 February Revolution had an immediate impact on the Mariinskij Teatr Opery i Baleta. The fall of the monarchy plunged the dancers into a state of confusion, and there was an atmosphere of uncertainty about the future of ballet. Against this background, the well-organized opera artists demanded unconditional power at the theater. Representatives of the ballet company, faced with this attitude from their colleagues, complained to the director of the Imperial theaters and the government commissioner of the former Ministry of Court. After the details of the conflict leaked into the newspapers, the representatives of the opera troupe officially declared their deep respect for the art of ballet—but the opera artists continued to treat their colleagues as a secondary presence in the theater. One reason for the conflict between the opera and ballet troupes was the group egoism typical for the revolutionary era, when the overly exploited role of the team eventually led to a confrontation with other teams. This according to “Из истории музыкального театра революционной эпохи: Борьба оперы с балетом” (From the history of musical theater of the revolutionary era: The struggle of opera with ballet) by Petr Nikolaevič Gordeev (Музыковедение 3  pp. 11–15). Today is the centennial of the beginning of the February Revolution! 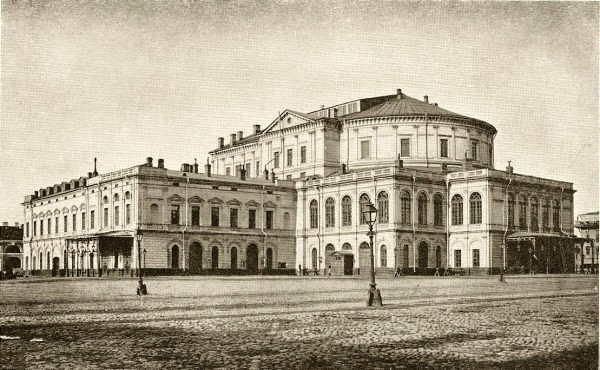 Above, the Mariinskij Teatr around the time of the Revolution; below, the Mariinskij stalwart Mariâ Nikolaevna Kuznecova. Wonderful story on the Marinsky theatre. I practically lived there when I was studying in Leningrad in 1972.